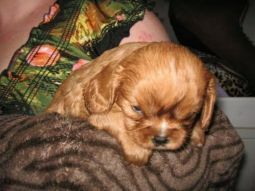 Cavalier King Charles Spaniel breeders links and breed information on pups4sale.com.au. 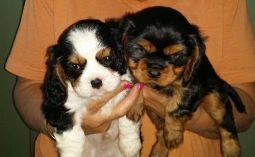 The Cavalier King Charles Spaniel is one of just a few dog breeds in the world that could be considered the perfect fit for just about any dog lover. They were originally known for being the dogs that were owned by English nobility, but it didn't take long for them to become extremely popular all over the world for their gentle and loving personalities. Thanks to Chelport Kennels and Eireannmada Kennels for the pictures of puppies & adults used on this page, and the additional information provided. The Cavalier King Charles Spaniel is a toy breed, but it is one of the biggest toy breeds around today. Of course, it is quite small when compared to the rest of the Spaniels in the world. Even though it is pretty small, the King Charles Spaniel is actually well built. It has a circular head, a full muzzle, a black nose, and a scissors bite. Male "Cavvies" grow to be right around 12 inches tall and can weigh up to 18 pounds. Females can be as tall as the males, but usually weigh a few pounds less. Their hair is medium in length and silky with feathered hair on their ears. The most popular coat color is tricolor, but it's not uncommon for them to be black and tan, red and white, or even dark red. Anyone who is looking for an outgoing, cheerful and playful dog breed should look no further than the "Cavvy". They love to play with people of all ages and, unlike other breeds with similar personalities, these dogs are actually quiet most of the time. They know when it's time to play, but they also know when it's time to calm down. Puppies will socialize and play with people and other animals pretty much right away. They aren't the quickest learners, but this isn't the type of breed that will get too crazy around the house, either. They are considered some of the best dogs for families with young children because they are as patient as can be and very rarely play rough. They were originally bred to be lap dogs, so it is in their nature to to be careful both when laying down and even when they are playing around the house. The breed is also fantastic with other pets because they assume that every living thing is a potential friend. This is great thing when socializing this breed with other animals, but it also leaves them susceptible to being attacked by aggressive animals, so it's important that owners keep an eye on them when at the dog park. The one thing this breed definitely cannot do is act as a guard dog or a watchdog. They may bark every once in a while if they sense someone is at the front door, but this is only because they expect it to be someone that they can play with. They love to socialize, so this is not a breed that can be left alone for long periods of time. They will get frustrated if they are left alone too long and can chew things around the house to release that frustration. The breed works very hard to please their owners, but it can take a little bit more time with this breed than it does with others to fully train them. As with most other toy breeds, it can take a while to house train, but by using positive training techniques, they can learn before they reach adulthood. They seem to have an easier time learning simple commands than they do any other type of training. This is probably because those simple commands usually get them a treat, while going on walks properly and house training are things that they simply have to learn over time. All in all, it is a bit tougher to train a Cavvy, but it is as rewarding for the dog as it is for the owners once training has been completed. Another one of the reasons why this breed is so popular with people of all ages is because they don't need high levels of activity to be healthy and happy. A short daily walk and moving around the house is usually enough to keep this breed in tip-top shape. They are content as long as they get just a little bit of exercise and can be around their owners as much as possible. Even though they don't need much daily exercise, the breed is still a great dog for very active families. They don't mind long car rise as long as they are with people they know, so going to the beach or on a long hike is just fine with this breed. Like all Spaniels, the King Charles loves to retrieve, so with a little bit of extra training, they can retrieve a ball or other small toys and bring them back to their owners. The breed doesn't shed a lot, but they should be brushed regularly to avoid matting. Extra care should be take around their ears where the longer hair grows because these areas tend to get tangled the most often. It is very important that owners brush their King Charles Spaniels before they are bathed or knotting can get so bad that the hair needs to be cut. The two areas on the body that should be checked regularly are the ears and the eyes. These areas can get irritated easily, so checking the ears for any type of discharge and the eyes for irritations and tearing is very important. Most individuals from the breed are pretty clean animals, so they don't need to be bathed too often. They also grind their own nails when going on walks, so this is another job that won't come up as often as it does with other breeds. Mistral valve disease, a major heart disease, is common with Cavalier King Charles Spaniels, so it's important that potential owners check if the dog's mother or father had any type of heart conditions. MVD is the most common cause of death with this breed and they are about 20 times more likely to get MVD than any other breed. 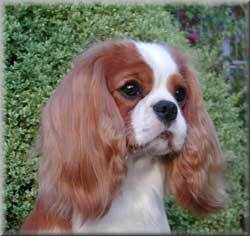 Other common health issues with Cavalier King Charles Spaniels are ear infections, deafness, cherry eye, and hip dysplasia. Even though there are some diseases to worry about with this breed, King Charles Spaniels actually usually live pretty long lives. In general, they will live between 11 and 14 years, but some can die younger and others will live a few years longer. The Cavalier King Charles Spaniel is one of those rare breeds that can live in just about any environment as long as it is kept clean. They are just as happy in a small apartment with caring owners as they are in a big house with a big backyard. This is why they are considered by some people to be the easiest dog to match with potential owners. The best owners for this breed are the ones that will allow the dog to stay close to them when they are at home. 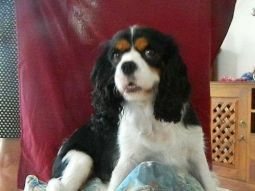 Cavalier King Charles Spaniels are very loving and affectionate, so they are happiest when they are allowed to stay close to their owners as much as possible. Even though King Charles Spaniels don't necessarily need to be with big families, they are extremely social animals, so the bigger the family, the better with this breed. Of course, they can live long and happy lives with families of any size as long as they are given the attention that they need. People who don't have too much time to spend with their dogs will find that the Cavalier King Charles Spaniel is a very bad match for them. They will chew just about anything in the house if they aren't happy and don't get enough attention, so this is a bad fit for individuals or families who simply don't have the time for this type of dog. Someone looking to get a family pet that can also act as a guard dog will definitely want to look at another breed. Any breed can surprise you in times of danger, but the Cavalier King Charles Spaniel is near the bottom of the list when it comes to good guard dogs, so it would be against their nature to be taught to do that job. This breed are absolutely fantastic dogs that have been loved for centuries because they are great companions and are happy to spend time with people (and other animals) of all ages. The one knock on them is that they are a pretty tough to train, but that should be no problem for anyone willing to take the time to get the most of this wonderful breed.